Later than planned, the new issue of the Newsletter of IUCN/SSC Mollusc Specialist Group, Tentacle 21, was just released. There is a suite of short papers on Neotropical land snails, each of which I will briefly mention. Tentacle can be accessed at http://www.hawaii.edu/cowielab/Tentacle/Tentacle_21.pdf. Maceira et al. 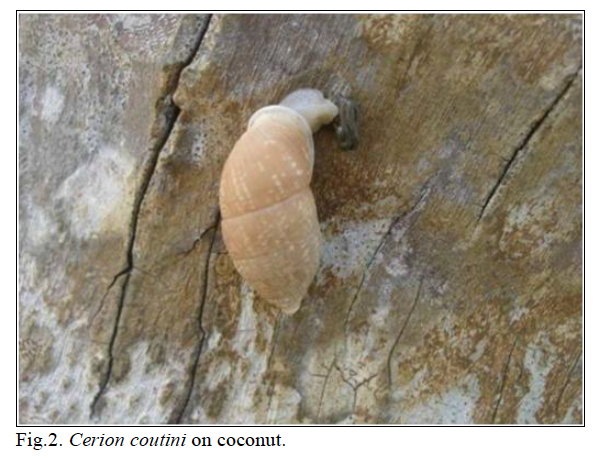 have a paper on land snails from a floristic refuge in eastern Cuba. 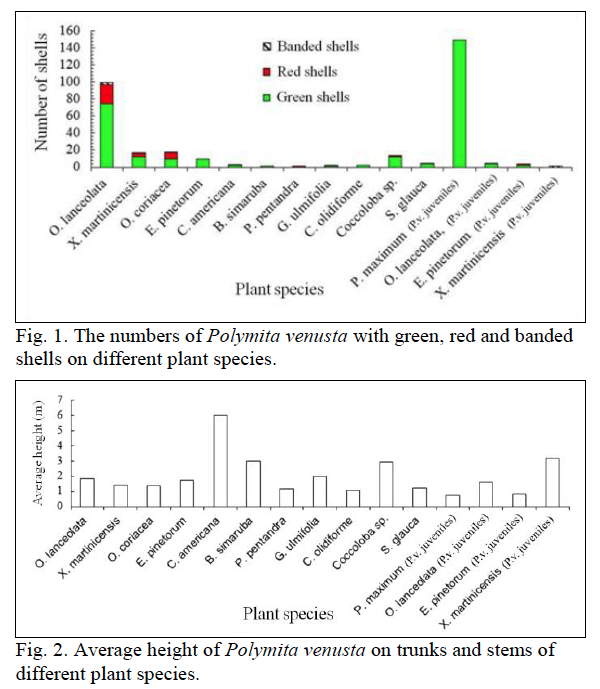 They noted an interesting preference of Polymita venusta colour morphs for different plant species; juveniles were mostly observed on different plants. Not having this seen reported before, this might pose a question on the relation of plant chemistry and snail feeding preferences. The average height above the ground was recorded at a single day of collecting; no explanation is provided for the observed differences, but a longer time-record of observations may be needed. Suárez & Hernández report new detailed data on Cerion coutini from the type locality at Tako Bay in eastern Cuba. Fernández & Franke found a relict population of the urocoptid Cochlodinella manzanillensis near Holguín, where the species was found in a very specific microhabitat of limestone outcrops in a shaded vegetated area. 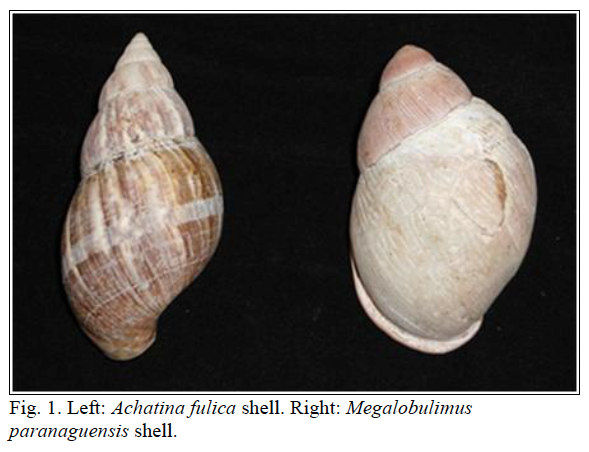 Birckolz & Gernet stress the need for education of people on the difference between the introduced Achatina fulica and local Megalobulimidea. Salvador et al. 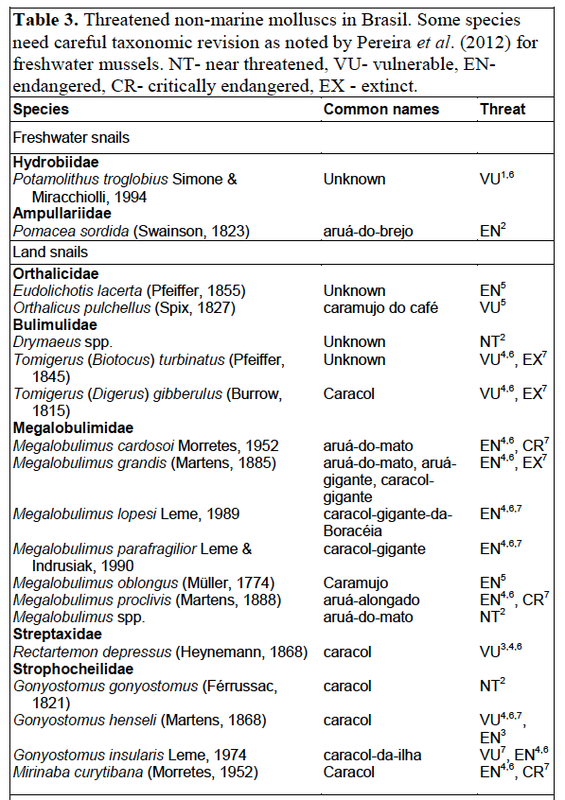 note that the five native land snails species have now joined by five invaded species. They briefly discuss the threat by goats and suggest that – since the island does not have a large permanent settlement – an inspection and quaratine program could be implemented for control. Dos Santos et al. discuss the Red List for Brazilian non-marine molluscs, the regional differences in this vast country and the possible use of some terrestrial gastropods as flagship species for the Atlantic Forest. Also Agudo-Padrón (2013a, b) touches this subject and pleads for more data on ecology and population studies. The relative abundance of Brazilian contributions reflects the growth in attention for land snails and their conservation in this country during the past decade. That is a hopeful sign, as there remains so much to be discovered in Neotropical malacology. Agudo-Padrón, A.I., 2013a. 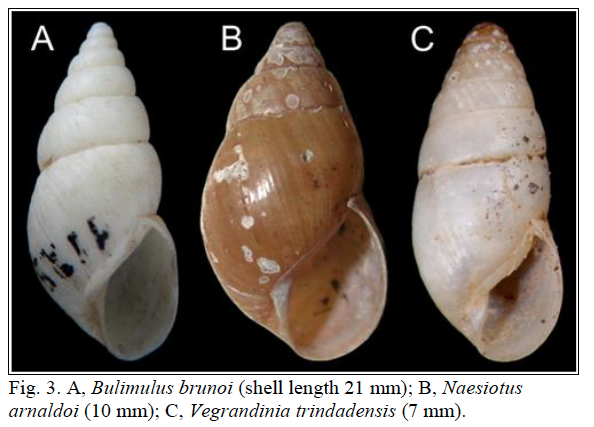 Threats to continental molluscs in Brasil, with special emphasis on land gastropoda. – Tentacle 21: 42-43. Agudo-Padrón, A.I., 2013b. Non-marine mollusc conservation in southern Brasil: current situation in northwestern Rio Grande do Sul State, Upper Uruguay River basin. – Tentacle 21: 44-46. Birkolz, C.J. & Gernet, M.V., 2013. The importance of educating people about the differences between alien Achatina fulica and native Megalobulimus paranaguensis on the coast of Paraná State, Brasil. – Tentacle 21: 9-11. Dos Santos, S.B., Miyahira, I.G. & Mansur, M.C.D., 2013. Freshwater and terrestrial molluscs in Brasil: current status of knowledge and conservation. – Tentacle 21: 40-42. Fernández, A. & Franke, S., 2013. 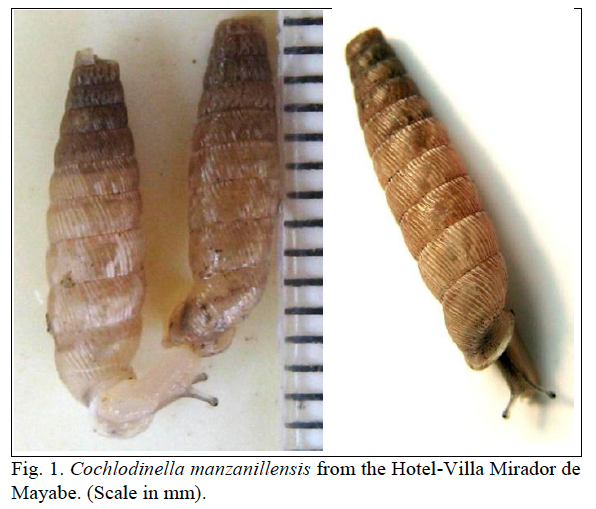 First record of Cochlodinella manzanillensis (Urocoptidae) in Holguin, Cuba. – Tentacle 21: 8-9. Maceira, D., Reyes, J., Tizón, A., González, S., Laurazón, B. & del Carmen Fagilde, M., 2013. Land molluscs and problems for their conservation in the Monte Barranga Managed Floristic Refuge, eastern Cuba. – Tentacle 21: 4-5. Salvador, R.B., Cunha, C.M. & Simone, L.R.L., 2013. The pulmonate snails of Trindade Island, Brasil. – Tentacle 21: 38-39. Suárez, A. & Hernández, N., 2013. Creion coutini (Pulmonata, Cerionidae) at Tako Bay Key, Baracoa, Guantánamo, Cuba.- Tentacle 21: 5-7. This entry was posted in Uncategorized and tagged brazil, cuba, literature on March 29, 2013 by bramb.